Split View is a new feature in Mac OS X which allows you to take two apps into full screen together, placing them split side-by-side. For example, you could take a Safari window into full screen mode and then split the fullscreen with another app, like Pages. 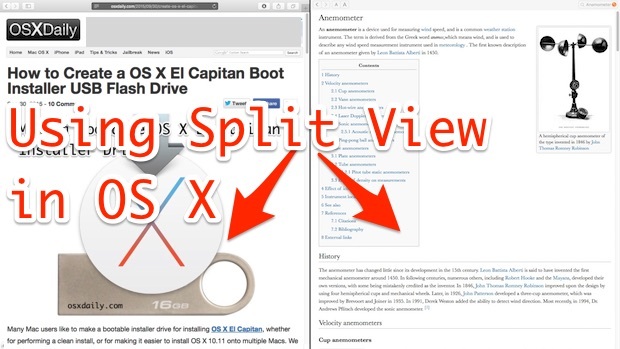 Split View sizes the windows automatically for any screen size, so you don’t have to drag them to accommodate the display, and it’s quite easy to use once you learn how to access and use the split screen feature on the Mac. This is a great feature for anyone who wants to focus, but researchers, writers, students, and developers will likely find this to be the most useful. 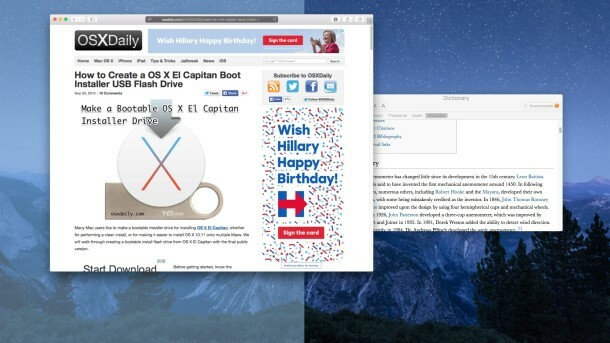 We’ll cover two ways to enter into Split Screen mode, or Split View, on the Mac. Of course you’ll need a modern version of Mac OS to have this feature, anything newer than MacOS X 10.11 (or later) will have access to this screen splitting feature on the Mac. Probably the easiest way to initially enter Split View is through a long click on any windows green maximize button. That’s all there is to it, that probably sounds more complicated than it is though, so I’d highly recommend trying it out yourself as there’s basically nothing that can go wrong by testing it. Just do a long press on the green button in a Mac window title bar and you’ll see for yourself how it works. You can escape Split View just as you would exit full screen mode in general, either by clicking on any of the split viewed windows green button again, or by hitting the Escape key. 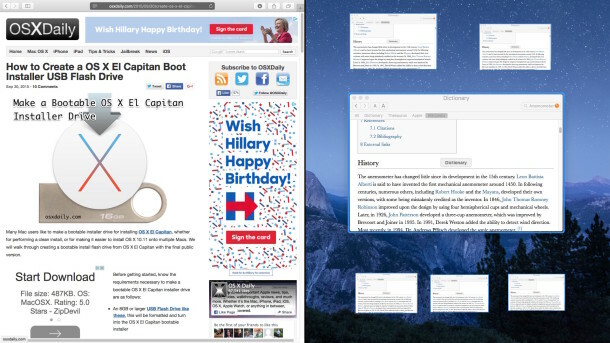 Either will leave Split View in Full Screen mode, returning you to your regular Mac desktop experience. You can also swipe to the side with a multi-touch trackpad or multitouch mouse to return to the desktop from split view, and then swipe back to return to the aforementioned Split View. As usual, you can swipe left or right to return to the desktop, or hit the Escape key to exit Full Screen / Split View mode. I may be missing something, but I’m struggling to fully grasp, what is so revolutionizing in this split-screen mode ? Is it just easiness to place to windows side-by-side ? Still I don’t use full screen mode all that much. For me, it would’ve been nicer if they did like what’s in Windows 7. I fully agree with your sentiment. Why in the world do we not yet have the built in ability within OS X to quickly move/manage windows with a simple press of the command button and related arrow key by now? Windows has had this for some time and it works fantastically for most needs, without some clumsy prolonged process that is not very smoothly done. With the simple pressing of 2 buttons you should be able to move a window on the desktop. Don’t understand why this has not been done years ago…? Tried Split View, didn’t like it, turned my Window Tidy app back on. Works like a charm. Tried Split View, liked it. Still using and preferring Moom for OSX by many tricks. I use Magnet from the App Store. I think it’s 5 bucks. Allows quadrant snapping too. Still cannot get it to work for me (early 2011 13″ MBP). Neither approach works. I also had some problems at first, especially with Mail. No matter for how long I clicked the green button, nothing happened. Restarting Mail resolved it. I must be missing something I can’t get this to work in any Apple Program in OS 10.11 Nothing happens when I click and hold on the green dot in any window. All i get is full screen view for that window. Even after enabling the feature and log out log in… won’t work am I missing something ? This is a very welcome feature but the fact that you have to go and click on the small green blob makes it unfriendly. I can get one window to split, but I get an “unavailable to split” message on more than one app I’ve tried. These apps have full screen capability. I’v been trying to find this too. It drives me nuts. The esc key is useful and now it’s not because of this. This doesn’t work. When I enter Split View mode (two documents in Pages), i cannot get out of it. The Escape button doesn’t work. I have Dock placed on the left side and when I go there with cursor – nothing. Well, every 10th time the Dock shows. 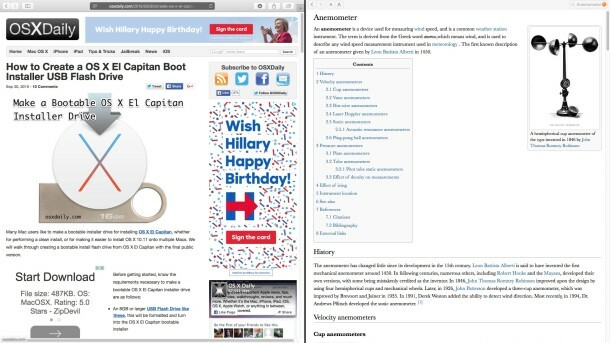 I have to click on some app (Safari) to leave Split View. Terrible! Hitting the escape button doesn’t take me out of split screen. I have to double tap my mouse to send the apps to the desktop background. Then I hover my curser over those ‘joined’ apps and a little white button with two arrows pointing in at each other appears. I click on that and I resume normal single view. A bit cumbersome, me thinks, but maybe I’ll get used to it :shrug: . Just read Drayl’s response to Maxbo (16th October). What “escape full screen button”? I’ll give Command+Control+F a go, but that’s just as cumbersome if not more so. Why can’t resuming single view just be the simple click of one button? if you just throw your cursor to the top of the screen then let go of the touch on the mousepad, it should also work to reveal the minimize icon and can escape split screen that way also. I just tried it and success. I went back to Double Pane when I found I could not scroll between worksheets in an Excel Mac 2016 workbook. It’s also a challenge with Split Screen, keeping the screens on the same desktop, once you take them out of split mode. Split screen is very handy for people like myself who like to multitask. Just because you have no use for it does not mean it is useless but only useless to you and those alike. I did find out that not all items with the correct green icon can be split screen together. for example iTunes and safari cannot on a 13″ macbook pro but it can be split screen on the iMac because the screen real estate is much greater than the 13″ macbook pro. I hope I helped those out there that found this weird at first. How many screens/windows can I get on the display at once? I was excited about this feature and now it tells me Microsoft Word isn’t available in Split Screen Mode. Really? Ugh. I was super excited when I finally figured it. Didn’t know this, especially the trick with Mission control. Works very nice, thanks!